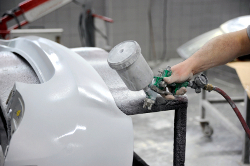 The mission of the Automotive Collision Technology Technician is to provide students with the instruction necessary for them to become competent automotive body paint/repair persons. This program prepares students for employment as Automobile Body Repairers and Painters. Training includes refinishing skills; sheet metal repair skills; frame and unibody squaring and aligning, use of fillers, paint systems and undercoats; related mechanical and welding skills, glass servicing and other repairs. Communication and leadership skills, applied mathematical skills, human relations and employability skills, and safe and efficient work practices are included in training. Mechanical and artistic aptitudes are helpful. The State of Florida requires students to meet a basic skills requirement prior to program completion. The basic skills grade levels for this program are: Mathematics 9.0, Language 9.0, Reading 9.0. Tools are necessary for employment. Completion time depends on the progress of the individual. The typical length of this program for the average achieving student is 1400 hours. Meet Florida Basic Skills requirements for the program.